The famous watch brand Omega presents its limited edition watch Constellation SEDNA in a round case of 18 carat gold SENDA. This alloy of gold, copper and palladium, has been developed and patented by Swatch Group. Officially, the novelty of the Omega Constellation SEDNA will be presented at the annual exhibition of watches and jewelry BaselWorld 2013. Constellation SEDNA model made in the same style as the first hours of collection Constellation, released brand in 1952. Stainless steel body with a diameter of 38 mm is equipped with a fixed bezel with Roman numerals. 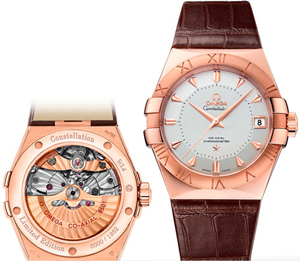 A silver dial placed overhead hour-markers, the logo of the brand label at “12 o’clock” and the date aperture at the label, “3:00.” Indication of hours, minutes and seconds by three arrows, made of 18-carat gold SEDNA. Closes dial sapphire crystal with double anti-reflective coating. The model is equipped with a coaxial Constellation SEDNA OMEGA 8501 automatic movement with a silicon balance spring, two wind-up reel, 60-hour power reserve and functions: hours, minutes, seconds, date. Novelty comes on a leather strap with brown buckle in 18-carat gold SEDNA. Limited edition watch in 1952 numbered copies. You can buy a watch in a special presentation wooden box with pink lining.